It is a testament to the size and quality of Hyperion's back catalogue that the company can run two reissue imprints simultaneously: Helios and Dyad. The latter, as its name suggests, offers two-disc box sets, and the deal is two discs for the price of one. Given that Hyperion discs have always been at the more expensive end of the market, or rather that full-price means exactly that from the company, we are still not talking about incredible bargains here, but an opportunity to hear some of the great recordings from the label's past is always welcome. 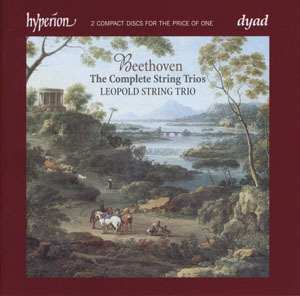 Beethoven's Complete String Trios comprise three opuses, the Trio Op.3, the Serenade Op.8 and the set of three Trios Op.9. All were written in Beethoven's early years in Vienna, but none are conservative of predictable. Beethoven was writing for some skilled performers, especially in the Op.9 set, and even though they were all published at the time, he seems to have had little regard for the conservative tastes of Viennese audiences, or for the amateur performance market. All of the hallmarks of the composer's later greatness are here: the traditional forms extended almost to the point of absurdity, the tangential key relationships, the virtuoso instrumental writing that always manages to keep at least one foot on the ground. And there is a lightness of touch that may or may not be a result of the composer's studies with Haydn. You couldn't mistake these works for Haydn though, and while they are recognisably 18th century they are also clearly looking forward to the stylistic and technical innovations of the 19th. Having said that, there is a significant difference between the quality of the works on the first disc to those on the second. The latter is devoted to the Op.9 set, and these three works have a sophistication and maturity that clearly sets them apart from both the Op.3 Trio and the Op.8 Serenade. Interestingly they are not any longer than their predecessors, nor is the thematic density any greater. But the drama in these works, the profundity of there slow movements and monumentality of their finales all put in them in a different league. The performances too are superior on this second disc. The first disc is also well played, but there seems to be a much greater unity of intent between the players on the second. All the players are technically proficient, although the viola sometimes lags a little behind the violin in terms of dexterity on the first disc. No such complaints on the second though, were only the timbre of the different instruments separates them. The recording quality is good, with the ensemble sounding clear and crisp throughout. Some may complain about a lack of atmosphere, such is the clarity of the sound, but you can't have it both ways. The violin can sometimes sound brittle and icy in the top register, but I suspect this is a product of the audio. The cello, on the other hand, sounds wonderful throughout. She has a real richness in the lower register and a valuable clarity at the top that really separates the voices in the more closely-voiced harmonies. This is an excellent Beethoven recording, but the second disc of the set is clearly superior, both in terms of the quality of the music and of the performance. And good as the first disc is, the disparity between them does somewhat compromise the logic of the reissue. If we were offered just the Op.9 Trios at the same price, we would not be losing out very much by not hearing the Op.3 or Op.8 works. Still, the word 'complete' in the title is bound to appeal to collectors. I just wonder how often they are going to listen to disc 1.